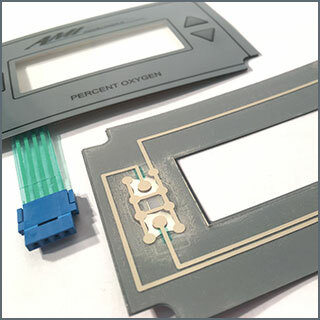 Use Membrane Switches to replace mechanical switches in electronic applications where low-cost, visually appealing, and durable input pads are required. Membrane switches are completely sealed, dust-proof and moisture proof, making them ideal for applications that require germicidal wipe-down or general cleaning. Membrane Switches can be constructed to meet IP67 water-proof requirements, by the addition of waterproof gasket materials or simply by changing the construction to embed the circuitry within a contiguous perimeter of adhesive. Both poly-dome and stainless-steel dome constructions offer a lifespan exceeding 1million cycles (actuations). 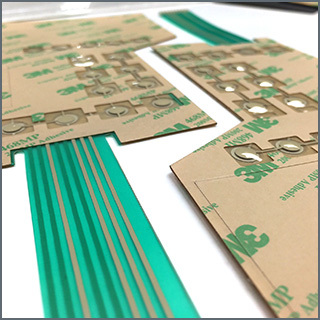 The circuit layers of a Membrane Switch are created by applying high-quality conductive inks using a silk screen printing process. 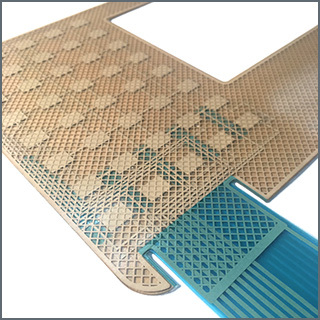 ESD and Ground Plane patterns can usually be integrated into the circuitry layer, eliminating separate ESD or grounding materials from the stack. LEDs and other surface-mount components can also be integrated – giving system designers the flexibility to locate control boards away from the front of a chassis. The heart of technology at AGE Nameplate: An innovative spirit and a “can do” attitude are the driving forces that have engineered thousands of custom membrane switches over the past 40 years. Go ahead, push the envelope: Nothing is too complicated for us!